The modern Novotel Leuven Centrum is a midscale hotel with rooms sleeping up to four in the lovely university town Louvain near Brussels in Flemish Brabant. The Novotel Leuven Centrum is a very modern, four-star hotel in the lovely town Leuven (Louvain) only a few minutes by train from Brussels. This midscale hotel is comfortably furnished and has rooms sleeping up to four. Although mainly aimed at business travelers, the Novotel’s family-friendly policies allow children up to 16 years old to share a room for free with parents and to breakfast for free. The Novotel Leuven Centrum is conveniently located at the edge of the town center just a few minutes walk to the station and the historic heart of Leuven. The Novotel Leuven Centrum is a typical hotel of the Accor Group’s midscale brand: a well-managed building with modern and comfortable furnishings. All rooms are non-smoking. 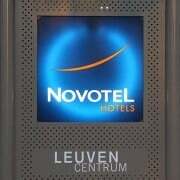 As with other Novotels in Europe, the Novotel Leuven Centrum has a free PC with printer and internet connection for guest use in the lobby. Video games and other toys are available for children. The hotel has the fairly standard Novotel Foursquare casual restaurant, which serves reasonable food but few would regret walking the kilometer to the town center for great food at low prices. The breakfast buffet is extensive but a bit pricey – online reservations often include breakfast at half price and when eating with children it does become a bargain. Hotel guests can use the small fitness center with hammam (steam room) for free. The bedrooms of the Novotel Leuven Centrum are very modern and comfortable. The rooms are typically for the Novotel group well laid out to optimize space. 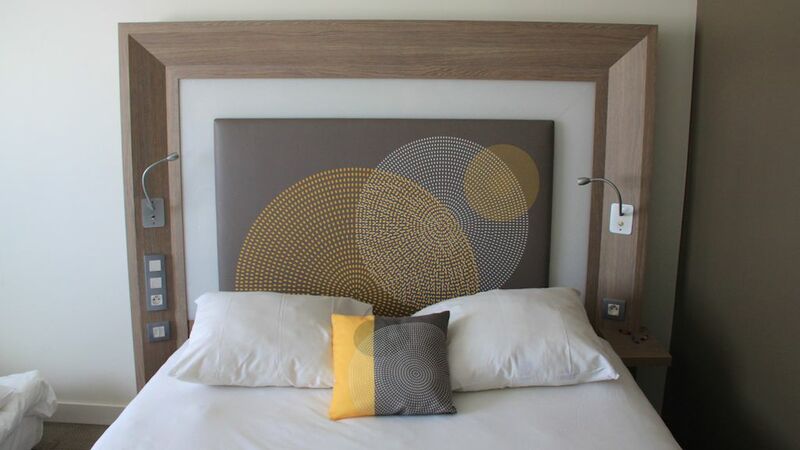 The bedrooms were refurbished in 2011 with the new Novotel style once again offering more closet space than was the case for the style used before 2010. The bathroom with walk-in shower uses the current greyish-brown color scheme, which looks smart but may not age too well. The layout is good with ample lightening and space for toiletries next to the washing basin. The toilet is in a separate room but as usual with Novotels in Europe without an own washing basin. Although the Novotel hotels mostly focus on business travelers, family-friendly policies make them a good choice when traveling over weekends and during vacations when bargains are often available. Many rooms can accommodate families of up to four with the two full-size children beds using separate mattresses and bedding. The rooms are generally spacious but do get a bit cramped when both beds are in used – it is easy enough to push the one bed underneath the second when not in use. Although these beds are more comfortable for sleeping, it is not that simple to return to a couch during the day as it the case with the older foldout sofas. Rooms have kettles for making coffee or tea, a bar fridge and in-room electronic safes. The hotel has busy roads on both sides of the building. Although road noise was not disturbing, it may be an issue for some, especially if planning on sleeping with open windows. The Novotel is around five minutes walk from Leuven train station, which makes the hotel also a great option for staying in a student town and taking day-trips to Brussels – only 20 minutes on the frequent direct train. 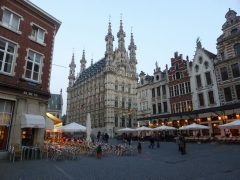 It is also a flat 15-minute walk from the Novotel to the busy Leuven town center with seemingly endless outdoor cafés and bars. Leuven is a student town so it is not only lively but prices can be low too. The parking lot in the basement of the Novotel Leuven Centrum is miniscule. However, public parking garages are available in the near vicinity but a few minutes walk away (and often very pricey). Accor hotels guarantees the lowest prices online on its own websites, where different deals are often available that may include breakfast for half price or even free. Novotel Leuven Centrum Hotel, Vuurkruisenlaan 4, 3000 Leuvem (Louvain), Belgium, Tel +32 16/939001.